Everything works fine at slow speeds, but when I accelerate the locomotive to medium or faster speed, the smoke generator stops producing smoke. I can hear the fan pulsing in time to the engine, but no smoke comes out. If I turn off the smoke function and turn it back on, it starts smoking again, or I slow down the engine, it will start smoking again. Does anyone know if this might be a programming issue I can fix? Wiring? Something else? Please take a look at these videos I took of the engine operating on a test stand. Thanks very much in advance for any help or advice you can give! If it stops after a while.. My guess would be it is overheating, and shutting off. - Else when it gets hot, there is a break somewhere.. As it warms up, everything expands, breaking the circuit. Can't watch the videos here.. Watched the videos, interesting problem, not one I have seen on mine. How are you generating the pulses? With decoder pulse simulator? Or connected to wheel rotation? Or load dependent? Maybe you could adjust CV65 to reduce the heating? Hi - I just read this older 2017 posting and wonder if you ever solved the pulse unit smoking issue? I had a similar problem. It was a CV adjustment on the Main decoder and not the smoke generator. Something to do with the pulse generator setting. It was on a massoth XLS. I no longer have the locomotive or paperwork so I don't remember the CV#. The setting had to be set to a value of 19 as far as I can remember. Hope this helps. I've installed two of these Massoth pulsed smokers now this month. One DCC round boiler unit in my customer's LGB Uintah steamer (I also sold him the loco on eBay) and also in his Uintah caboose. No issues with the loco smoke unit, but a couple days ago I was testing the one in the caboose, this is the DCC rectangular unit, and it stopped operating after 1 - 2 minutes. I shut it down and restarted the smoker, and did the same thing. The only CV changes to this smoker was to the DIP switch #1 on top from Off to On = Diesel type continuous smoke. The other was the CV for operating fan speed, changed it to "0" slowest fan speed. The only cables connecting are the track power since no pulse is needed for a caboose smoke stack. Upon further investigation I found that the plastic tube had been pushed down into the generator and was touching the heating element and was beening melted on the edge. This smoker's heating element is closer to the top of the smoker than the round boiler model. So, I had to cut off the deteriorated end and then used some plastic heat resistant glue for the fitment, especially outside of the plastic tube and the topof the smoker. I double checked that the plastic tube did not protrude too far into the smoker.......actually I unscrewed the top of the smoke and glued it that way. Overnight the glue hardened and seems pretty firm to hold the plastic tube in place. 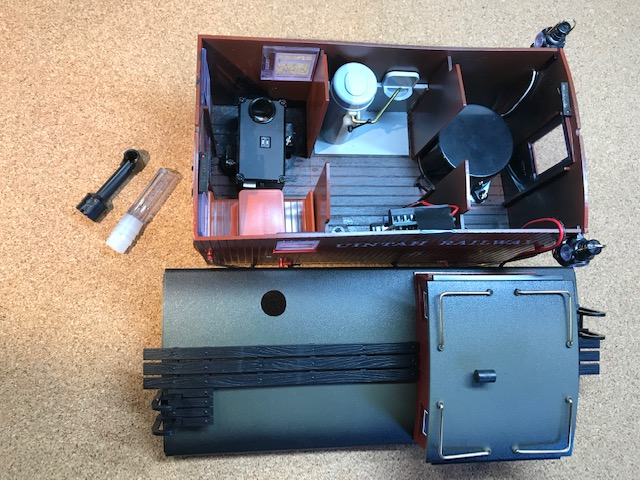 Just some lessons learned about plastic tubes inserted into this model smoker! But even on the slowest fan speed, she sure pores out the smoke! I just thought this was worth mentioning. Nothing to do with the unit shutting down but needless to say> here goes. Never ever, ever , ever turn the Locomotive upside down with smoke fluid in it. Not even if it stops smoking and you think it's empty. There is still a tiny bit of fluid in there. You will wash the lube off the fan motor. I learned the hard way twice. I was so used to turning regular Seuthe equipped loco's units upside down to work on them. I would just place a paper towel under them to catch the fluid. No biggie but with a pulsed unit, it's a biggie. The unit will become super noisy and vibrate almost as if the fan was rubbing. You will have to disassemble the unit to access the fan motor. Don't use 3 in 1 oil to lube it either as it won't last but maybe 30 minutes then becomes super noisy again. I used Label's #8 (a synthetic based oil) and it is quieter now then it was brand new. It has been back together now with about 1.5 hours of use and still nice & quiet. Only time will tell or until I forget again and flip it over. LOL! Okay, the key to installing these heavy flow smoke generators is to use a large enough diameter tubing. The original exhaust tube design I made for the LGB caboose was based upon a short piece of large diameter tube, then inserted into it a smaller diameter piece and then an even small diameter piece that attached to the smoke stack on the caboose. The smoker would cut out after a couple minutes from overheating. I thought at first it was CV adjustment issue, but after trying all CV adjustments, even increasing the fan speed to max RPMs, it would still cut out. Finally I discovered the smaller exit tubing design was restricting the flow of the smoke and thus causing the unit to overheat. Once I designed a better "mousetrap" it works like a charm now! See photo of the base I cut from a plastic plumbing hose connector, that fits snug into the opening of the smoker, then attached two sizes of tubing from that. Thanks for the update that's good to know. That caboose has all mod cons! LGB333, Thats great news! Nice fabricating job! Thanks for sharing that with us. You mentioned in post#6 that you used a heat resistant glue at one point. What was the glue you used and did it work well? I have an installation job that might require some glue and was just curious what to use? Also the fitting you used, is it working good with heat? If so, what kind of fitting is it? Thanks, Richard.